Brighten Your Life: How Bright Light Therapy Helps with Low Mood, Sleep Problems and Jet Lag, an eBook by Daniel F. Kripke, M.D. Think about the dark dungeons of despair, the heart of darkness, the gloominess of a funereal mood. This language tells us what people have always known. Sadness rules where it is dark. Think about a person who has Seen the Light. Think about brilliance. Think how we describe the scintillating joy of love by singing, “You are my sunshine.” We know that light makes us happier. Take a rose or a petunia indoors and it will wilt. Bring a peach or an apple tree indoors and you will get no fruit. Only a few houseplants will flourish indoors. People are similar. People were designed to be outside. It is part of what makes us human. Perhaps somewhere back in evolution, our ancestors may have resembled monkeys or chimpanzees that climbed trees and lived in dark forests. For example, the “Gorillas In The Mist” lived in a gloomy rainforest. In contrast, as our ancestors became human, they moved out more into equatorial fields and savannahs, became able to run further, and started looking about further for food. Some seasons had clear bright sun every day and some had rain, but it was always bright near the equator where they lived. Much of the time, there was hardly even partial shade. Our modern human ancestors became intelligent in places which were indeed very sunny. It is for such a life that our bodies are adapted. When people settled down, about the time that recorded history began, our ancestors were still outdoors people. The men were outdoors hunting, fishing, farming, and fighting. The women were outdoors farming also, when they were not gathering food, grinding grains, weaving, cooking, or doing other things done mostly outside. Humans still spend much of their time outdoors where most people live: in China, in India, and in many of the tropical developing countries. Indoors, we may wilt. Only in recent generations, as society urbanized, did people begin spending most of their time indoors. Even in my lifetime, we have moved more indoors. As a little boy, I went outdoors every day to play, even in the winter. I walked to school and back, whereas more contemporary children ride. When television arrived, kids came indoors more, but we still played outside, because the attraction of the fuzzy black and white tube or the radio of my boyhood years was hardly comparable to modern television selections. How different it is today, when people of every age group spend so many hours watching television. With often hundreds of channels on the cable or satellite, there is always something fascinating for every taste. Big screen color has extra attraction, also. As if that weren’t enough, along came video games, and even more recently (for most of us), tablets, the Internet, and movie downloads. The result is that we spend more and more time in front of the tubes and less and less time in daylight. The tubes may seem bright, but the reason that we watch them in dark rooms is that they give off very little light. There is another problem in the cities of today. When I was a boy, I used to feel safe walking down Fifth Avenue in New York City. As a medical student, I walked at night in every part of the city. People no longer feel as safe. Older retired people, especially elderly women, may no longer feel safe walking around the big cities or going to the parks. The result is that older people are spending more time indoors. Construction of more indoor health and exercise facilities may be another factor keeping people indoors. To gain more understanding of the lighting which contemporary Americans experience, my colleagues and I have been measuring how much time people spend outdoors in San Diego. We have studied a random population sample. It appears that in San Diego, California, people are outdoors in daylight less than one hour per day on average. It is true that some people are outdoors for hours, shopping, playing golf, strolling on the beach, or whatever, but these people are not the average. There are an impressive number of people who are in daylight only ten or twenty minutes a day or even less. Some San Diegans go through most days experiencing no daylight at all, besides which, sometimes they experience only dim indoor lighting. We have found several factors which determine how much bright light people experience. The proportion of time spent indoors or outdoors is the most important influence. Season is next important. As might be expected, people in San Diego experience almost twice as much light in the summer as in the winter. Daylight savings time seems to be as important a factor as season itself, though season and the time standard are difficult to separate. We have found that volunteers from San Diego minority groups experience somewhat less light than people of European ancestry, and women are outdoors less than men. However, somewhat to our surprise, we have found that in San Diego, women from age 20 to age 80 years seem to experience rather similar amounts of daily light. Remember that San Diego is one of the most pleasant coastal cities in Southern California. We have more sunny days than 80% of American cities. Moreover, in San Diego, it is rarely too hot or too cold to be outdoors. Phoenix has more sunshine than San Diego, but if you ever walk around downtown Phoenix in the summer, you will find few people outdoors. In hot climates like Phoenix, people with air conditioning find it more comfortable indoors. More widespread use of air conditioning may also be a new factor keeping more people indoors. With colleagues, we compared people’s light exposure in San Diego with the pattern in Rochester, Minnesota. Rochester is a charming small city in a rural farming area. In the summer, people in Rochester were out in daylight a bit more than in San Diego, perhaps because summer days are longer further north, or perhaps because more were busy with farming. In winter, on the other hand, people in Rochester were in daylight less than one third as much as in San Diego. The shorter winter days in Rochester are not the main reason that Minnesota people experienced little daylight. Most of the winter, Minnesota is just too cold to stay outdoors more than a person absolutely has to. In larger cities, people might see even less daylight than in Rochester, because the big cities are now built for traveling underground. In cities like Toronto, a person can take the subway to work and walk for blocks underground to arrive at the office or shopping without ever setting foot outside. Our eyes adjust over such an astonishing range of lighting, that it is hard for us to realize how much brighter it is outdoors than indoors. Because your eye is a poor judge of brightness, modern cameras contain light meters called photometers to measure brightness. The camera photometer tells you that your camera might need a one-second exposure for an indoor shot (without flash), when the same camera would capture an outdoor scene in 1/1000th of a second. That would be a thousand-fold difference. Consider what scientific photometers tell us about the brightness of our varied environments. Modern photometers measure lighting in a measure called lux. Lux is a measure of how brightly things are illuminated. One lux is approximately as bright as the lighting from a candle 1 meter away in a dark room. An older measure, one foot candle, is the illumination produced by a standard candle 1 foot away. Since lighting diminishes as the square of distance, and 1 meter is a bit more than 3 times 1 foot, illumination 1 meter from a candle is less than 1/10th of the illumination at 1 foot. Thus, 1 lux is .0929 foot candle. Similarly, illumination at 2 yards (6 feet) is only 1/36th as bright as at 1 foot, and lighting 10 feet from a candle is only about 1/100th of the lighting at 1 foot (or 0.01 foot candle). The brightness 30 feet from a candle in a dark room is about the same as 0.001 lux, which is the brightness of starlight on a moonless night. When we distinguish shapes in starlight, we are seeing in only 1/1000th of a lux, which is about the darkest light in which we see. In contrast, on a bright summer day when the sun is overhead, the brightness looking horizontally toward the horizon is about 10–20,000 lux. It may get a bit brighter on a sandy beach or a snowy ski slope, but few eyes can stand more than 20,000 lux even briefly. Many people will put on sun glasses before it gets to 10,000 lux, so such people never expose their eyes to more than 3000–5000 lux. You may have heard that daylight reaches approximately 100,000 lux at noon on a clear summer’s day, looking straight up at the sun, but if we value our eyes, we never look directly at the noonday sun. Therefore, 10–20,000 lux is about the maximum that we experience in sunlight. In summary, the human eye has the ability to see in a remarkable range of lighting. We can see throughout a visual range of more than six orders of magnitude (2 X 107) or 20 million fold, from 0.001 lux to as much as 20,000 lux falling on our eyes. Many scientists do not realize the dimness of indoor lighting, because illumination engineers often teach that indoor lighting is typically 100 to 500 lux. They are thinking of bright offices and shopping centers (which are often especially brightly lighted), and they are measuring the lighting with their photometers pointed toward the ceiling lights where we do not look. If we measure in the directions in which the eye looks, we have found that most indoor settings are much dimmer than 100 lux. A fashionable living room might be 20 to 50 lux or less. A fashionable bar or restaurant could be as dim as 1–2 lux. In a lecture hall where scientists watch slides, 1–2 lux is about average. Movie theaters are darker than 1 lux. Thus, it could be 1,000 or even 10,000 times brighter outdoors in daylight than indoors. A big surprise for us was to discover in what very dim light people often watch TV. In a recent study, the mid-range subject averaged 31 lux in the evening, but some people’s TV rooms are only about 1 lux (about the same as the light of a full moon). That is dark! Please do not think that the TV screen itself is very bright. It may appear bright, but it does not light up a room. You could not read comfortably by TV light alone. Because of the huge range of different lighting conditions in which we can function, an extremely wide range of lighting experiences is possible. We used a special instrument called an Actillume to measure how much illumination people actually experience. The Actillume measures both activity and illumination (Acti… + illum…) It was invented in our San Diego laboratory with the assistance of the late Mr. William Gruen of Ambulatory Monitoring, the company which manufactured and sold this instrument. The Actillume can measure lighting (exactly like a camera light meter or photometer) and store the results every minute for several weeks in its internal computer memory. In measuring a randomly-selected group of 318 San Diego volunteers from 40 to 64 years of age, we found that in the course of a two-day recording, the volunteers who received the brightest illumination (spending bright days outdoors) were experiencing about 1,000 times the light exposure of those who received the dimmest lighting. Evidently, those receiving the dimmest lighting never went out in daylight, and even indoors, their rooms were lit more for TV than for reading. We were quite astonished to learn that different people experience a thousand-fold range of lighting. Such differences must have many affects. Incidentally, there quite a few wrist-mounted and body-mounted instruments that have been developed to record the illumination that a person is experiencing. It won’t be long before you will be able to monitor your light exposure with your watch as you can now monitor your pulse rate. The averaged light exposure over 24 hr. for the median San Diego man was 350 lux, with only 278 lux for women. Since much of the night was spent near zero lux, time awake may have averaged close to 500 lux. That does not mean that most of the day is spent in 500 lux – to the contrary, to achieve an average of 278–350 lux, a short time (e.g., under one hour) is spent in bright daylight of several thousand lux, and much of the rest of waking time (even during the daylight hours) is spent below 100 lux. Below the median daytime illumination, we have found that more people report depression. For some people, less than an hour of daylight seems insufficient to uphold their mood and may be a cause of depression. Depression is increasing, according to some studies. Sales of antidepressant drugs have been steadily increasing. As far as psychiatrists can tell, there is more depression today than there was a generation or two ago. Depression seems to be starting at an earlier age. The suicide rate is higher among teenagers and young people. Perhaps illegal drugs are a factor in increasing suicide today, but it could also be that depression is causing more drug and alcohol use. The rate of suicide has also been increasing among the elderly. Depression is more of a problem in urban areas: the depression rate is lower in rural areas, where people may go outside more to work. In summary, depression and suicide are increasing, possibly because people are experiencing less daylight. What is depression? Part of depression is a gloomy feeling at times of loss – when we lose a job, a friend or have other disappointments. Some of the most serious sadness comes when we lose a loved one such as a parent, spouse or child. Such sadness is normal (in the sense that we all experience bereavement, not in the sense that losses are not painful). Such sadness is often psychological in origin, and since bad experiences fade away, such sadness usually gets better by itself. But recovery may be agonizingly slow. Further, there are other kinds of depression more biological in origin. Some people – before the end of their lives about 15% of Americans – experience at least once what we call a major depressive disorder. A major depression is so much depression that the person feels depressed, down, sad, or gloomy most of the day nearly every day, or loses interest in normal pleasures. Moreover, by definition (for a depression to be “major”), the person with major depression has at least three or four additional symptoms such as loss of weight or gaining weight, loss of sleep (or sleeping too much), becoming agitated or slowed down, becoming fatigued, feeling guilty and worthless, losing the ability to concentrate, and actually thinking about death or suicide. We call it a minor depression if there are fewer symptoms. We call it a dysthymic disorder if the symptoms are milder than major depression but persistent with little let-up for at least two years or more. We do not consider mourning and bereavement as a major depression unless the disturbance remains severe for at least two months, or unless it becomes so severe that the bereaved person is in danger or suicidal. If major depressions happen at least once in a lifetime to 15% of us, the milder depressions such as dysthymia, minor depressive disorders, and other grumpy moods may occur in an additional group of almost equal size. Among older people, especially above age 70 years, the kind of depression characterized by feeling worn out, depleted, and tired is particularly common, even though this is not called a major depressive disorder. Nevertheless, minor depression in the elderly can be quite disabling. Almost all depression among elderly people is accompanied by sleep disturbances. As a matter of fact, sleep disturbance is often a warning sign of impending depression. There is another kind of usually-mild depression found especially among women before the menopause, which tends to occur in winter. We call this “seasonal affective disorder” or SAD, which in most cases is another name for winter depression. Oddly enough, people with seasonal affective disorder often say that they sleep MORE than usual, although it may be more a matter of feeling fatigued and spending extra time in bed rather than actually being asleep. Another peculiarity of SAD is that people with this problem often have particular problems in getting up in the morning. In more severe cases, they may have a clearly delayed sleep phase, that is, they both have trouble falling asleep until late (e.g., long after midnight) and they also wake up late. Some delay in sleep patterns occurs in the average patient with major depression but is particularly prominent in SAD. Among older patients with nonseasonal depressions, waking up early is more common, but early awakening can be found in SAD also. Many people with seasonal affective disorder experience increased carbohydrate craving such as eating sweets, and they sometimes gain weight and need larger clothing in the winter, though loss of appetite is also common in SAD. Some people with SAD feel withdrawn and want to curl up like a hibernating bear, but they may have fewer symptoms of sadness and guilt than other major depressives. Like other forms of depression, there is a milder form of SAD called “subsyndromal SAD” which is simply less severe, but it is more common. People with the milder seasonal disorder suffer mild lethargy, gloom, and weight gain in the winter, sometimes oversleeping in the mornings, but not a really disabling depression. It seems quite clear that many people with SAD have the winter pattern of recurrence at one time in their lives and the more common nonseasonal pattern on other occasions. In my opinion, both seasonal and non-seasonal depressions are probably somewhat different manifestations of the same illness, just as some people with measles have more spots on the face and others have more on the body. Some people have just one depression in a lifetime, but probably for most people with depression, depression is at least occasionally recurrent. The pattern of those recurrences is extremely unpredictable for most people with depression. Most major depressions do not occur in the winter. Actually, there may be more depression in the spring (and perhaps in the fall) than either in winter or in summer. We now know that depressions occur more often in people who do not get enough brights – who do not experience enough bright light. Among the randomly selected people in San Diego who volunteered to wear an Actillume, the trend was for people who experienced less bright lighting (largely because they spent less time in daylight) to report more depression. In San Diego, there is only a small difference in available daylight between summer and winter, so the relationship of low light to depression could not be explained by the winter season. On the other hand, winter depression becomes increasingly common as one examines the more northern areas of the United States, especially Fairbanks and northern Alaska. It is very clear that as one moves north – and arrives at places with shorter, darker winter days – the prevalence of winter depression increases. Cold winter temperatures are also related to winter depression, which may suggest that part of winter depression is caused by cold weather keeping people indoors. As might be expected, the pattern of recurrent summer depression seems to be most common in the hottest parts of the U.S., though it does not seem as common as winter depression. It may be that summer temperatures which keep people indoors in air conditioning (and out of daylight) are the explanation for summer depression. Please see below the warning against manic-depressives using light or wake therapy without a mood stabilizer. Remember the caution with which we started discussing light treatment of depression. You should check with your doctor. If you have significant depression, especially if you might have a major depressive disorder, if bad mood is keeping you from your normal activities, or you have any thought of hurting yourself, you should certainly get your doctor’s help. It is nice that light is sometimes enough for the mild problems, but please do not count on bright light alone if your depression is really causing trouble. This caution is similar to the caution with other health aids. An average person knows how to get some exercise, but if you have had a heart attack, you would need to discuss exercise with the doctor. An average person knows it is good to skip dessert, but if you have diabetes or a stomach ulcer, you need to discuss your diet with your doctor. Similarly, people might try light for minor problems by themselves, but for serious depression, a doctor’s advice should always be sought. We used to think about bright light as an alternative to the better-known treatments for depression, especially as an alternative to antidepressant medicines and counseling. That is not my viewpoint any more. Experience shows that even when light treatment helps, it is often not enough. We realize now that light treatment works very well in combination with the antidepressant drugs. These are drugs like citalopram, amitriptyline, trazadone, and lithium – there are quite a few kinds which are good. In fact, it seems that bright light often works best along with antidepressant drugs. The benefits may multiply each other. I should qualify this statement by noting that we do not have adequate controlled trials comparing light treatment alone with antidepressants alone or their combination. One fairly large controlled trial which may give us important new information is presently taking place in Canada, and results might be available sometime in 2013. I was formerly quite enthusiastic about the antidepressant medicines for outpatients. These medicines help millions of people. However, usage has grown so great that it is no longer clear that antidepressants are needed by everybody who is getting them. Moreover, recent critiques which examined the controlled drug trials which weren’t published (as well as the more favorable trials which the manufacturers published) have indicated that our appreciation of the antidepressant drugs may have become over-enthusiastic. Realistically, for patients not depressed enough to be hospitalized, the amount of the benefit of the antidepressant drugs is usually very small. Nevertheless, depressed people in most cases do better with antidepressant medicines than without them. There have been literally hundreds of studies which prove that the antidepressant medicines provide more benefit than they do harm. Do not be scared by all the sensationalism about side effects which has appeared in certain news media. It is true that all antidepressant drugs have side effects, but so do water, sugar, salt, apples, oranges, and just about anything else in life. Compared to driving an automobile, much less a riding a bicycle or trying roller blades, antidepressant drugs are very safe. For most people who are really depressed, the side effects of antidepressant drugs are worth it. Talk to your doctor about it. Counseling is also good for depression. There are new kinds of psychotherapy of depression which really do work. There have now been many studies which prove the benefits of modern psychotherapies of depression. A long time ago, I was trained in the old Freudian methods of treating depression (dream analysis and talk about childhood, for example), and I have to say that I do not believe that those old methods helped depression much. Doctors trained in the newer methods accomplish more. Psychotherapy certainly seems generally safe. In all probability, psychotherapy plus antidepressant drugs works better than the medicines used alone. There have been no good tests of the combinations of bright light and psychotherapy or bright light, medication and psychotherapy, but there is every reason to think that these combinations would be safe and more effective than a single treatment. The ongoing Canadian study should give us better information about the value of combining antidepressants and bright light. Indeed, the combination of bright light, antidepressant drugs, and psychotherapy might be the best for many people. I wish there were more results of testing light’s benefits to describe, but no treatment in medicine has been tested long-term in every possible combination with other treatments. Talk to your doctor about psychotherapy. Bright light treatment for winter depression has been supported by dozens of studies demonstrating beneficial results (though there have been a few studies with unsuccessful results). The Clinical Practice Guidelines issued by the U.S. Department of Health and Human Services recognize bright light as a generally accepted treatment for winter depression. Until recently, there were rather few studies of bright light treatment of nonseasonal depression, however, there are now at least 15 controlled studies showing that bright light reduces symptoms in nonseasonal depression. Scientists rate how depressed patients are both before and after treatment using descriptive methods called depression rating scales. For example, a doctor who talked to the patient gives scores for how much the patient seemed sad, guilty, without appetite, suicidal, and so forth to add up a total depression score. One of the most widely used scoring methods is the Hamilton Depression Rating Scale or HDRS. Because depressed people usually recover spontaneously, given enough time, the depression ratings of patients who are given no active treatment usually drop over time. Thus, even when depressed people who volunteer for research studies are given an inactive placebo pill or placebo (inactive) light, their depression ratings decrease after eight to 16 weeks. In a clinical trial, volunteers are randomly given either the active treatment (such as bright light or an antidepressant drug) or the inactive placebo for contrast. To calculate how much of the average patient’s recovery was due to the active treatment, I considered the baseline depression rating (e.g., the HDRS score) as the 100% reference, and then the depression ratings at the end of the trial were computed for active treatment and for control treatment as a percentage of this baseline. Then, the net benefit of the active treatment was computed as the percentage reduction of depression ratings with active treatment minus the percentage reduction of depression with the control treatment. Our first studies of bright light tested only one single hour of bright light to treat hospitalized patients with nonseasonal depressions. The patients were awakened to receive the light treatment from two hours to one hour before the patient’s usual planned time of awakening, so that these patients experienced one or two hours of wake therapy at the end of the night. We now call getting patients up early “wake therapy,” because to call this helpful treatment “sleep deprivation” gives the wrong impression. Most patients were drug free, but some were taking antidepressants during light treatment. As compared to a control hour of light placebo, which presumably produced the same sleep curtailment, the bright light reduced mood ratings about 12%. As will be explained, a 12% net gain as compared to placebo is similar to benefits achieved by antidepressant medications after weeks of treatment, so it was remarkable that such substantial benefit could be obtained with one single hour of bright light. In an extension of our initial studies, 25 drug-free patients were treated with bright light each day for one week, compared to 26 patients treated with a dim-light placebo. Depression ratings were 18% lower after bright light than after placebo, a benefit which was statistically significant. These and other data suggested that one-week treatment produced more benefit than only one hour of bright light. More recently, another one-week study of unmedicated inpatients observed a somewhat larger net advantage of 24.2%, which was likewise statistically significant. Even a study reporting no statistically significant benefit achieved a 12.2% net advantage in HDRS ratings of the bright-light treated group, so that the failure to achieve statistical significance could have been partly due to an insufficient numbers of subjects. These studies of drug-free depressives were consistent in demonstrating advantages of bright light treatment. Two European studies were important because they examined effects of bright light (as compared to a dim-light placebo) in patients who were also receiving antidepressant medications. In both of these studies, the net relative advantage of bright light over dim light was 27%. Since the medication-only groups also did well in these combination studies, the additional improvement gained by the light-treated patients was especially impressive. A third European study also demonstrated substantial benefits of bright light compared with placebo among patients simultaneously receiving antidepressants. Not only do these studies show that bright light improves the antidepressant response of patients who are receiving antidepressant medications, but they leave the impression that the benefit of bright light may be greater when patients are also receiving antidepressants. A light triple treatment for nonseasonal depression was then tested. Ironically, this new light treatment was developed by Dr. Neumeister working under Dr. Kasper at the University of Vienna – the same place where Sigmund Freud trained so many years ago. The Vienna psychiatrists treated patients in the hospital with serious nonseasonal depressions who were being treated with antidepressant drugs but had not yet responded. At the start, the doctors in Vienna awakened these patients in the middle of the first night and kept them awake for the rest of that night, while starting bright light treatment and also continuing with antidepressant drug treatment. About 70% of these patients felt dramatically better on the day after they had been awakened early, and they continued to feel better for the following days. About 35% of their depressive symptoms were relieved immediately. It had been previously known in Europe that such awakenings often relieved depression on the day of the early wakening, but the patients usually had relapsed almost completely the next day. Because of this relapse, few doctors in America thought that wake therapy was really very useful. If adding bright light can prevent the relapse, we have a new way to relieve the symptoms of severe depression in one day. There is nothing like it. This excellent response to bright light combined with wake therapy and antidepressants has now been reproduced by other studies at European hospitals. Our group has also reproduced this effect in a small study of outpatients, who awakened themselves at 2 AM in their own homes. Several studies have shown that bright light may be useful for depressed elderly in nursing homes. In addition to these studies, there has been one controlled study showing that 10,000 lux produced more benefit than 2,500 lux, when treatment was only 30 min. per day. This study in effect confirms that bright light is an active treatment. Also, two studies have found shorter hospitalization times needed when depressed patients were in bright rooms than in rooms with darker windows. A well-designed study showed that bright light was useful for premenstrual depression. There have been only three studies with good scientific methodology which failed to confirm significant benefits of light for nonseasonal depression. Two of these studies indeed showed bright light was associated with benefit by every measure, but the statistical evidence was insufficient, possibly because these studies needed more patients. The other was an unlucky study, where by chance, the patients who received bright light had a poorer prognosis at the outset than the patients with whom they were compared. A recent study of three-week light treatment of elderly outpatients was quite successful. Dr. Klaus Martiny in Denmark has done an excellent five-week study showing that five weeks of light treatment was effective for nonseasonal depression. Dr. Martiny has done an eight-week study combining light, wake therapy and antidepressant drugs which showed remarkable benefit. In summary, there is now extensive evidence that bright light treatment reduces symptoms for both nonseasonal and seasonal depression. For nonseasonal depression, the triple combination of bright light, half-night’s wake therapy, and medication might produce approximately a 35% reduction in symptoms in one week. There is a need for longer-term studies. Regarding the more-common non-seasonal depression, a formal Cochrane Collaboration meta-analysis showed that bright light is effective for non-seasonal depression. Cochrane reviews are the international gold standard for evaluating the clinical evidence for various treatments. In an abstract, Tuunainen expanded this analysis. A formal American Psychiatric Association Review found that bright light was effective for SAD but questioned the value for non-seasonal depression. However, the Psychiatric Association authors later admitted that they had made an error in computing their meta-analysis, so the benefit was greater than they had concluded. A more recent French review concluded that bright light therapy was useful for nonseasonal depression, at least combined with antidepressant drugs. 5.A. Is bright light only good in winter? The earliest controlled report of bright light treatment for seasonal affective disorder (SAD) described remarkable 52% net benefits within one week; however, the bright light–treated patients were given high expectations which were not matched in the placebo-treated group. Patients with high expectations often report improvement through the power of positive thinking, but benefits of positive thinking need to be separated scientifically from the effects of bright light. Later and larger studies of SAD treatment have indicated that bright light may not be dramatically more useful than antidepressant drugs, and it is not clear whether SAD patients respond better to bright light than other people with depression. Even if we were sure that SAD patients responded better to light than other depressed patients, it would often hard to tell what type of depression a person has. Follow-up of SAD patients by Dr. Rosenthal’s research group showed that the majority of patients first defined as SAD eventually displayed summer symptoms, if their illnesses continued to recur, and many needed antidepressant drugs. Over follow-up, such patients may be perceived as nonseasonal according to accepted criteria. Many SAD patients eventually require both bright light treatment and antidepressant medications outside the winter months. Because of controversial criteria and complex clinical course, it may often be impossible to define whether a depressed patient does or does not have SAD, so restricting light therapy to SAD would not be practical. Even when seasonal pattern can be distinguished, there is no assurance that light treatment will work better than in nonseasonal patients, nor does seasonality exclude the usefulness of antidepressant medication in addition to bright light. In conclusion, in my opinion, bright light is useful for people who are depressed, whether or not we think that they have SAD or winter depression. It is likely that for both nonseasonal and SAD patients, a combination of bright light, antidepressant drugs, and wake therapy is advisable. To have perspective on the results of bright light treatment, it is useful to understand the benefits which result from antidepressant drugs. Hundreds or perhaps thousands of controlled trials of antidepressant medications have been reported, with a great preponderance of evidence that medicated patients improve somewhat faster than comparison patients given placebo. Placebo means an inactive, dummy treatment. Nevertheless, many physicians suppose that the benefits of antidepressant drugs are greater than such trials actually demonstrate. Because antidepressant medications may require six to 16 weeks to achieve substantial benefit, patients given placebo (dummy pills) for the same interval often display spontaneous remission. They get better by themselves, perhaps helped by hope and by encouragement from the researchers. The alleviation of symptoms attained during antidepressant drug treatment in most studies is due more to this spontaneous remission than to medication benefits. The benefits of antidepressant drugs are only clearly understood when the percentage remission of symptoms achieved with placebo is subtracted from the remission accompanying medication. Incidentally, when antidepressant drugs fail to work well, addition of lithium treatment may be helpful. Also (particularly for young women), addition of thyroid hormone (T3 or triiodothyronine) may be helpful. It is not wise to emphasize comparison of antidepressant drug benefits with bright light benefits, because there have been no direct randomizing comparisons of the two treatment approaches. Although the benefits of bright light might be greater and are almost certainly more rapid than benefits of medication, much more is known about the long-term benefits of antidepressant drug treatment, which has been much more extensively studied. Moreover, there really is no reason to inquire whether one treatment of depression is better than the other. The important point is that bright light and antidepressant drugs are best used in combination, probably also combining at least a half-night of wake therapy. Let me explain about body clocks. We really do have a 24-hour clock inside our bodies. The main body clock is in the brain in a little area called the suprachiasmatic nucleus, smaller than a grain of rice. As the name implies, the suprachiasmatic nucleus lies in the hypothalamus just above (supra) to the optic chiasm, the place behind the eyes where the optic nerves cross. The suprachiasmatic nucleus (or SCN) receives nerve impulses from those optic nerves which come from the eyes. Basically, bright light influences the suprachiasmatic nucleus clock to keep our bodies set to the correct body time. Of course, today, modern digital watches rarely need resetting, but our body clocks can run a bit too fast or too slow like watches did in the good old days. Thousands of years ago when humans were sleeping outside, the light of dawn probably set the suprachiasmatic nucleus each morning, something like great grandfather used to set his pocket watch every morning by the time broadcast on the radio. The light just before sunset probably set our body clocks also, to keep them very nicely in time. If great grandfather’s watch was reset every day, running a little fast or slow never got to be much of a problem. If we are outdoors at dawn and sunset, our body clocks do not cause much problem either, because the light keeps the time set well enough. The figure above models the human phase response curve. When a person’s sleep has a normal relationship to the circadian clock system, light exposures from just before the time of falling asleep until past the middle of the night causes the clock (and the time of sleepiness) to delay later. Bright light in the last couple hours of the night causes the clock (and the time of sleepiness) to advance, that is, to shift earlier. Light in the middle of the wake period, e.g., the afternoon sun, has little or no effect on the timing of the body clock. This is exactly the same mechanism which sets the body clock in a rooster, so it knows when to crow in the morning. In fact, light sets the body clocks of the birds of the air like larks and owls and the beasts of the field, like cows and horses, lions and lambs. Light also sets the body clocks of flowers and trees. It is the natural way. Our human body clocks do sometimes tend to run too fast or too slow, and if we are not outdoors at dawn and dusk for long enough, the timing of our body clocks can get to be a problem. In fact, there are two possible kinds of problem: the problem when the body clock is running too fast and the problem when the body clock is running too slow. Let us discuss each of these common problems. When the body clock seems to run too fast, it gets ahead of the day, and sends its signals to the body too early. Then we say the timing of the body clock is advanced over what it should be (or the phase is advanced, to use a mathematical term). The main symptoms of advanced sleep phase are 1) falling asleep too early, and 2) waking up too early. People with an advanced sleep phase typically nod off in the evening reading or watching television – or even talking to the family. They may fall asleep before they go to bed. Sometimes they have to wake up to go to bed and turn off the light. Trouble paying attention to reading, homework, and favorite television shows is a problem for them in the evening. A more dangerous problem is falling asleep behind the wheel of a car in the evening. Later in the night, the person with advanced sleep phase wakes up too early. Their internal alarm clocks may wake them up at 3 AM or 4 AM or 5 AM, long before the rooster crows, and they become distressed, because they would like to sleep later. Sometimes there isn’t much fun to be had at 4 in the morning, when everyone else is asleep. Also, if the person with advanced sleep phase has somehow managed to stay up to a reasonable bedtime, there may not be enough time before 3–5 AM to get enough sleep. People with advanced sleep phase may typically feel most energetic in the morning and least energetic in the evening. To some extent advanced sleep phase is really a social condition. A hundred and fifty years ago, when most Americans lived on farms and there was little artificial lighting besides candles, it may have been customary to fall asleep at 8 or 9 PM and to awaken at 4 or 5 AM to milk the cows, feed the chickens, and so forth. The life style of farm animals is in synchrony with the natural light cycle, so many animals get half of their sleep before midnight and have half of their waking hours before noon. In a 21st century society, we like to stay up for prime time TV and the late show. A lot of people do not start working before 9 AM. In this social context, the sleep patterns of one hundred fifty years ago are perceived as a sleep disorder. Advanced sleep phase is often merely a maladjustment of natural biology to the latest social customs. Advanced sleep phase seems to be much more common as people live beyond 60 years of age into their 70s, and 80s. One theory for which there is some laboratory evidence is that our body clocks speed up as we age, even though most body processes are slowing down. A body clock which runs too fast tends to very slowly become advanced. Deterioration of vision may also be a factor. As the lenses of our eyes become cloudy and thicken into cataracts, we see “as through a glass, darkly,” so that much less light strikes the retina of our eyes. With the eyes’ remarkable ability to adapt to changes in lighting, we may not realize the clouding of the lenses until they are shadowing almost 99% of the light falling on the corneas. Older people also have smaller pupils, which let in less light, like the higher f stops of a camera. Finally, glaucoma, macular degeneration and other retinal problems may impair the eyes’ light sensing mechanisms. All of these eye problems might cause elderly people have a poorly-adjusted body clock unless they get extra light. Advanced sleep phase seems to be more common among elderly women. We do not know why, but several studies have shown that among people of retirement age, the body clocks of women are set, on average, about an hour earlier than those of men. It is as if the internal alarm clocks of retired women are set to awaken them an hour earlier than those of their husbands. We do not know if this is a major factor which makes insomnia more common among elderly women, but it is a fact that after menopause, women complain of insomnia much more than men do. Many doctors believe that the hot flashes and sleep disturbance of menopause go away after a few years, but I think these symptoms often persist throughout the rest of life, unless a woman takes estrogen hormone replacement. To inform our body clocks that sunset is too early to become sleepy, we must put enough evening light before our eyes for the body clock to react as if it is still day. Since rural electrification brought electric light to every home, it has become possible to light up our homes quite brightly long after the sun goes down. Lighting fixtures become more efficient year by year, so it is even easier to light up a home today than it was twenty or thirty years ago. The great enemy of good lighting seems to be television. As the channels multiply, people watch more and more television or computer screens, which often are equally dim. Technologists tell us that a wedding of televisions, computers, and telephones is on the way, when life may be built around the screens. Because TV screens have not really been very bright, many people watch in rather dark rooms. Possibly, the larger, brighter TV’s being sold in the last couple of years will help with this problem. In actual measurements of people from 60–79 years of age done 10–20 years ago, we have found half of elderly people spend the evening in less than 31 lux. About 10% were spending the evening (probably watching television) in about 1 lux – about the same as sitting outdoors in moonlight! It is not hard to understand that the dim lighting of some TV rooms and living rooms is insufficient to make the body clock react as if it were day. Dim evening light may result in an advanced sleep phase. Solving advanced sleep phase is very simple for some people. Often, all that is needed is a brighter fluorescent lamp by the TV chair. The most convenient lighting by a TV chair would be a fluorescent or LED torchiere (a tall lamp like a torch). In the past, I recommended a popular style of halogen-bulb “torchiere” lamp which bounces light indirectly off of a white ceiling and really lights up a room. Over 40 million of these halogen torchieres have been sold in the U.S. as the price kept coming down and down. There is no special advantage of the halogen lamps, except that they are extremely inexpensive and easy to install, and they have a fashionable appearance. Actually, the halogen lamps are inefficient for two reasons. First, halogen (and other) incandescent bulbs intrinsically use far more electricity than fluorescents of the same brightness. Fluorescents produce more light per watt. A 50-watt fluorescent and a 300-watt halogen are roughly equivalent. The halogen produces a bigger electric bill. Second, the halogen’s very bright point of light and ultra-violet content might make it risky to look at 300-watt halogen light directly – something I never recommend. This is why the 300 watt halogen lamps are generally designed as indirect lighting. Because the light has to be bounced off the ceiling, indirect lighting is much less efficient than a fluorescent with diffuser which can be viewed directly. Another problem is that the 300 watt halogen bulbs get so hot that they can cause severe burns or set draperies or other objects which might touch them on fire. Over a hundred fires and several deaths have been reported due to halogen torchieres, but this is not a great risk considering over 40 million sold. Finally, the halogen bulbs burn out quickly and are difficult and expensive to replace. Fortunately, fluorescent torchiere lamps are now appearing on the market. A 50-watt fluorescent is roughly equivalent to a 300 watt torchiere. These fluorescents will solve the safety problem and have superior energy efficiency. Fluorescent bulbs last much longer. LED lamps will have even better energy efficiency and longer life. Despite a higher initial cost, over several years, fluorescent and LED lamps will lower the electric bill enough to be less expensive in the long run. Because much of the torchiere light is indirect, a torchiere lamp may only produce 200–300 lux at eye level. The fluorescent light boxes which were discussed for treating depression can produce 10 to 30 times the lux at the eye as a torchiere of similar or greater wattage bouncing off the ceiling, because one can look directly at the light box close to the eyes. Nevertheless, torchiere lamps often seem to produce sufficient light for a TV room, a computer room, or other parts of the house. After all, 200–300 lux is about 10 times as much as the 31 lux which is the middle measurement of evening lighting for elderly people. I now have quite a number of patients who have largely resolved a nagging advanced sleep phase problem with a simple torchiere lamp. There are probably many other ways of lighting a TV room which would work equally well – I simply do not have as much experience with other lighting styles. For advanced sleep phase, the time to use the bright light is for 1–3 hours late in the evening, often when a person is sitting in a chair reading or watching tv (during dinner sometimes also works). It will not make much difference if a person gets up and down from the chair near the light, as long as the light is experienced most of the time. If a person does not stay in one room most of the evening, it may be necessary to brighten up more than one room. Some people need a longer exposure than others, depending both on the brightness of the lighting and on individual factors. 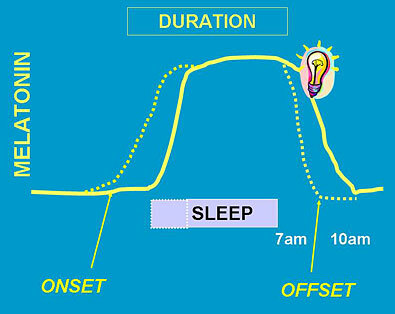 The later in the evening that the bright light is used, the more powerful will be its benefit for advanced sleep phase. However, some people will find that they should dim down their lighting for about one hour before they wish to go to bed, to avoid overdosing and causing trouble with falling asleep. A person with advanced sleep phase might begin to feel some benefit after using brighter evening light every night for a week, but it might take a month or two before the maximum benefit is reached, especially because it takes some time to restore good sleep habits. This treatment does not work unless the evening light is turned on at full brightness: I advise against using dimmers. Once the problem is under control and the body clock has readjusted, a person with advanced sleep phase can often afford to skip bright evening light on special evenings when they have to entertain or go out. Nevertheless, usage of brighter light in the evening probably needs to become a life-long habit. A person who benefits from bright evening light will often relapse within a month after skipping the bright light too often. An interesting problem with bright evening light occurs when a spouse or other housemate has a different sort of body clock, possibly even a delayed sleep phase (see below). Bright evening light which is good for one person may be too much for another. This can usually be adjusted simply by arranging the placement of the lighting within the room, so that the person needing the bright light is in a brighter area than the person who does not need it. Couples have told me, however, that treating one spouse sometimes helps the other also! It all depends on the ways in which people are similar or different. People with advanced sleep phase should avoid very bright light very early in the morning, because morning light has a bad effect for people whose body clock is already too advanced. Sometimes, walking or running outdoors soon after dawn or a long drive to work in the morning is a problem making advanced sleep phase worse. A person with advanced sleep phase might be wise to wear blue-blocking sunglasses when outdoors between when the sun comes up and noon. Such sunglasses have a particular orange color which filters out the blue light. There are two conditions which typically cause early awakening: advanced sleep phase and endogenous depression. “Endogenous” depression means the kind of melancholic mood which seems to come from inside the body and less from psychological stresses. There seems to be some relationship between advanced sleep phase and depression, particularly in middle age and beyond (though there are also many depressed people who are delayed). Some of my patients with advanced sleep phase problems also seem a bit depressed, so it is difficult to distinguish the two conditions. Bright light in the evening seems to work both for advanced sleep phase and for depression with early awakening, so sometimes it may not be too important to distinguish which condition you might have (or maybe both). Nevertheless, if a depression is serious enough to keep you from your normal occupations and pleasures or to cause weight loss, guilt, thoughts of death, or other serious distress, let me repeat that you should talk it over with your doctor. For serious depressions, light treatment should often be combined with the treatments like anti-depressant drugs and counseling. Lithium has some beneficial effect for advanced sleep phase. Moreover, for more serious depression, I often prefer one of the powerful fluorescent light boxes to the torchiere lamps, since the torchiere lamps simply do not deliver as much light to the eyes. If a simple light treatment is not enough for a serious depression, it is definitely time to talk with your doctor. When the body clock seems to run too slow, it gets behind, and sends its signals to the body too late. Then we say the timing of the body clock is delayed past what it should be. The phase is delayed, to use the mathematical term. The symptoms of delayed sleep phase are 1) falling asleep too late, sometimes after lying in bed awake for many hours, and 2) waking up too late and having trouble getting up on time. People with delayed sleep phase typically have trouble falling asleep unless they stay up much later than they would wish to. Having gone to sleep so late, people with delayed sleep phase often oversleep and have trouble getting to work or carrying out morning activities, as if their bodies’ internal alarm clocks do not ring on time. Indeed, people with severe delayed sleep phase will sometimes sleep past noon. People with delayed sleep phase – unless they drag themselves out of bed – are often rather long sleepers, and they often have a grumpy mood or real depression. In the figure above, a normal person has the “sleepy” phase of their body clock aligned with when they prefer to sleep, so they sleep well. Blood melatonin begins to rise an hour or two before sleepiness descends, and it falls at about the time of awakening. Body temperature falls in the evening and during sleep, beginning to rise a couple of hours before awakening. In the figure below, a person with delayed sleep phase disorder finds that the time of sleepiness does not begin at the time of preferred sleep onset, but sleepiness persists after the person would like to be able to get up for the day. 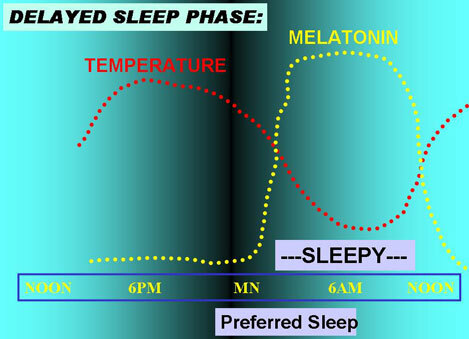 The physiologic rhythms of melatonin and body temperature are also delayed, making it hard for the delayed person to arise at the preferred time. Of course, when people prefer to sleep depends on school and work schedules and many social factors, and the timing of their sleepiness varies also. People with a delayed sleep phase often feel somewhat rebellious or angry with authorities, perhaps because they have experienced so many years of people insisting that they wake up when their body clocks are telling them to keep on sleeping. Unfortunately, people who do not come to school or work on time are often regarded as lazy, so they have not received the sympathy they deserve for their body clock problems. Also, since people with delayed sleep phase may not feel very alert until well past noon, and their best and most energetic hours are sometimes past midnight, they may have learned to enjoy their habitual late activities and be reluctant to give them up for bed. Successful treatment needs a willingness to change these habits. The timing of sleep patterns – being advanced or delayed – does run in some families. It is likely that people with delayed sleep phase have some genetic changes in the body clock. It is also peculiar that delayed sleep phase seems to develop somewhat late in puberty – often around 16 to 18 years of age – and be at its worst in the early 20s. College students and graduate students without fixed classes seem to be particularly prone to delayed sleep phase – there certainly isn’t much quiet in the dormitories before midnight at our university. One wonders if that rebellious trait – the wish to get out from under the thumb of authority – sometimes enters into a delayed sleep phase. There is even some evidence in animal studies that the younger adult animals adopt a different daily rhythm, apparently to keep out of the way of the more dominant more mature adults. Nevertheless, we do see delayed sleep phase among mature adults and even in some elderly people. It is apparent that too little morning light exposure has something to do with the development of delayed sleep phase. We all get up later in winter – on standard time – than we do in the summer, when daylight savings time causes us to set our alarm clocks an hour earlier. Of course, the dawn is earlier in the summer. A number of studies indicate that even after taking account of the time change, people tend to stay up later and get up later in winter than in summer. This trend seems to be especially prominent in northern areas (above 45° latitude), where winter nights are particularly long. In those areas, people may see no bright daylight in the morning, as they arrive at school or work before the sun comes up. Theorists have speculated that experiencing dawn is particularly important for setting our body clocks, and even, that the gradually waxing light of dawn has some special signaling significance for the body clock. In fact, Ms Stephanie Rosen in my laboratory found some evidence that people who have lighter window shades (which let in more dawn light) tend to fall asleep a little more rapidly and arise a little earlier. Whether or not the waxing light of dawn is an important signal, it is a fair bet that people whose sleep phase is delayed are not experiencing enough bright light in the morning. That is the key to treatment. The best treatment for delayed sleep phase is to increase the dose of light which the person receives soon after their habitual awakening time. The brighter the light, the sooner after waking up it is experienced, and the longer the period of exposure (up to 3–4 hours), the better the result is likely to be. The problem is that delayed sleep phase is often a stubborn condition which can only be controlled by very bright light for 1–2 hours each morning. Arranging to receive that light may be hard to fit in with daily habits. I usually find that people with delayed sleep phase need one of the bright fluorescent light boxes. Although torchiere lamps and other increased lighting can be helpful, ordinary fixtures usually do not seem to be sufficient. One convenient way to get a strong dose of morning light is to use a light box (maybe a box arranged for 10,000 lux) for 30 min at breakfast time, since eating and reading the morning paper do not interfere with the benefit. For people who work at a desk, placing the light box on the desk and turning it on all morning might be effective, even if one cannot sit at the desk all of the time. If it is convenient to be exposed to bright light for several hours each morning, around 2,000 lux might well be sufficient, allowing the light box to be placed at the far side of the desk, or allowing the use of a more customary-appearing bright fluorescent or LED desk lamp. Looking at the phase-response curve (below), we see that the best time to give bright light to somebody with delayed sleep phase is as soon after their spontaneous waking time as possible, that is, just when their natural sleepiness ends. This is a bit complicated, since at the beginning of treatment, the body's preferred waking time may be quite late in the day. It is probably best to start using the bright light after the (rather late) spontaneous waking time, and then to give the treatment earlier and earlier in the day as the person starts falling asleep earlier and waking up earlier. A really strong dose is best for the first few days of treatment to reset the body clock, so I often advise that patients start treatment on a weekend when it is practical to spend 3–4 hours outdoors right after waking up. Once a person is able to fall asleep at a reasonable hour and to awaken at the desired time (e.g., 7 AM), the best time for treatment is in the early morning. In the first week or two of correcting delayed sleep phase, it is very important to use bright light treatment for a full dose every day, 7 days per week. 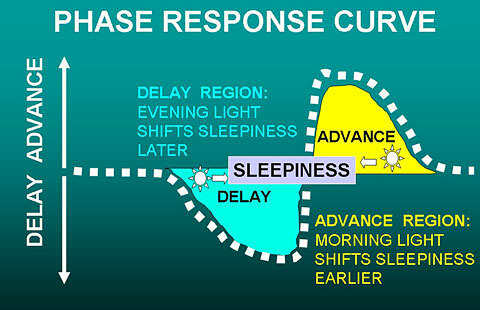 As diagrammed above, a person with a delayed sleep phase usually also has the phase response curve delayed, and the end of the natural sleepiness time is late in the morning or even after noon. We are talking about when it is easiest biologically to sleep and then arise (e.g., on weekends), not when the person needs to arise to get to work on time. Because the body clock and its phase response curve are delayed, the best time for light to advance the body clock is also later. Moreover, as shown above, bright light early in the morning might make the delay worse. 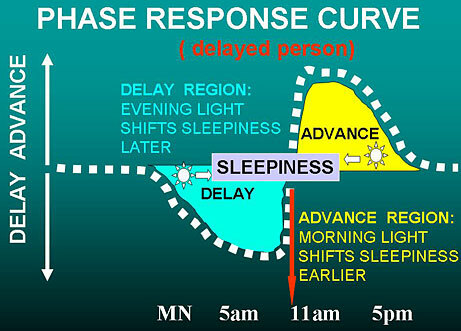 This can be a problem for delayed people who struggle to get up early to get to school or work, when the person’s phase response is still in the delay zone. For such occasions, blue-blocking orange sunglasses may be helpful outdoors to prevent light exposure on the way to work from making things worse. Once the delay in the body clock is corrected, the phase response curve will be advanced and early morning light will be helpful. 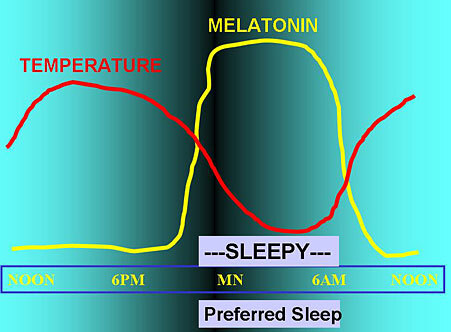 The diagram above shows how bright morning light pushes melatonin onset and offset earlier (dotted lines), so the person can get to sleep earlier. Just as it may be hard to set an alarm clock for the proper time but easier to set the alarm to ring daily once it is set to the correct time, similarly, it takes less bright light to keep the body clock set properly, once a delayed body clock has been reset. After a delayed body clock has been successfully readjusted and the person’s habits have readjusted to the new sleep hours also, a bit less effort may be needed to keep the body clock from delaying again. Nevertheless, people with delayed sleep phase commonly relapse if they stop using light treatment loyally. Also, it is very harmful for people with delayed sleep phase to stay up late on weekend nights and to sleep late on weekends and days off. A person with delayed sleep phase should try to keep a regular wake-up time, 7 days per week, because once a little relapse is permitted on days off, the person with delayed sleep phase will find it too hard to recover. There are many ways of arranging to get added bright light in the morning, such as installing bright lighting in the bathtub or around the bathroom mirror (like the dressing-room lights of movie stars), increasing lighting in the bedroom and kitchen, and removing sunglasses when driving or walking to work. Unfortunately, in my experience, these arrangements are often insufficient for a seriously-delayed sleep phase. Difficult delayed sleep phase usually requires a fluorescent light box. Spending 30–60 minutes or more outdoors in early morning daylight (after the sun comes up) should be effective. Unfortunately, winter fog and rain often make getting daylight exposures difficult even in San Diego (where I live), whereas in the coldest and hottest parts of America, getting enough morning daylight is well nigh impossible during parts of the year. Do not think that sitting near a window or opening curtains will work – it is almost never bright enough. For these reasons, I do recommend the bright light boxes for delayed sleep phase. The theoretical importance of the dawn signal has inspired some doctors to try “dawn simulators,” which slowly increase artificial room lighting in about the same pattern that dawn might creep through a bedroom window. These doctors believe that the natural dawn signal is so powerful that it will reset the body clock even during sleep, when the light has to pass through the eyelids, and that dawn simulation does not have to be very bright. Several dawn simulators designed to mimic the light of dawn are now being sold, though they have not been tested very well. There is preliminary evidence that dawn simulators may have some benefit, perhaps not as powerful a benefit as a 10,000 lux light box. In treating patients with SAD who tend to get up late, lighting waxing only up to 250 lux, entering through closed eyelids during sleep, did seem to reset the body clock and to partially relieve the depression. Another test of administering increasing brightness through a sleep mask seemed to show some benefit. It would be nice to see dawn simulators more thoroughly tested, since they may be a particularly convenient way of dealing with delayed sleep phase. Japanese researchers have found that supplemental vitamin B12 is useful for delayed sleep phase, even when the patient does not have any evidence of vitamin deficiency by the usual criteria. They recommend about 1 mg. (1,000µ or 1,000 micrograms) of oral vitamin B12 daily. This is much more than the minimum daily requirement which is contained in most multivitamin pills. The vitamin B12 which can be easily purchased in 1 mg. doses at North American grocery stores is a slightly different vitamin from that tested by the Japanese, but it probably makes no difference. Unfortunately, the best Japanese test of vitamin B12 for delayed sleep phase did not demonstrate any good effect. Nevertheless, since vitamin B12 in these doses has practically no known side effects and is very inexpensive, I do recommend that people with delayed sleep phase try the 1 mg dosage. Depression does seem to be associated with delayed sleep phase, particularly among young adults and women before menopause, and particularly when the problem occurs in the winter. Indeed, delayed sleep phase disorder and seasonal affective disorder tend to be associated (that is, comorbid). Our research group also has some very new evidence that the some of the same genetic variations may cause delayed sleep phase and depression. With delayed sleep phase (as with advanced sleep phase, as previously mentioned), it is often difficult to tell when the problem is a sleep timing problem and when it is a real depression, because the problems often seem mixed together. Bright light which corrects delayed sleep phase does usually seem to lift mood symptoms also. Nevertheless, as I mentioned before, if a depression is serious enough to keep you from your normal occupations and pleasures or to cause weight loss, guilt, thoughts of death, or other serious distress, let me repeat that you should talk it over with your doctor. If light treatment for delayed sleep phase does not alleviate the depressive symptoms, it is certainly time to talk with your doctor. They say that everything good is either risky, immoral, or fattening. Light treatment is neither immoral nor fattening, but unfortunately, it does have risks which you should know about. To put this in perspective, water has risks, sugar has risks, salt has risks, apples and oranges and sirloin steak have risks, sunlight has risks, and artificial light treatments have risks also. It takes some judgment to know what is too much – of water, sugar, salt, or indeed, of light. All effective antidepressant treatments, including bright light, can trigger mania. Manias triggered by bright light can be serious, and perhaps constitute the most important risk of bright light treatment. What is mania? Mania is a specific unusual mood in which a person becomes too happy, too euphoric, too irritable or too hyper, in a way which causes trouble. Manic people suffer from rapid speech, they talk too much (they feel pressure to keep speaking), and they have too many ideas. They are distractible and often jump from one idea to another. They are hyperactive, and often awaken early or cannot sleep. A person who is manic is not the person’s usual self. Sometimes manics venture things with a high probability of getting hurt or suffering financial losses. Although mania may resemble happiness, cheerfulness, or high energy – in its extreme form, mania is quite risky for the manic person and for the people around. Let me give you some examples of the poor judgment manics show. A manic patient was driving 80 mph down the freeway, and when stopped by a highway patrol officer, he started a fight. He was lucky that the patrolman only beat him up a little. Another patient, a conservative middle-aged mother of several children, became manic enough to go down to the red light district and solicit male customers. An impoverished patient bought two Cadillacs in one day, though he couldn’t afford a new car at all. Another manic patient on pension ordered a private jet, asking the company to paint it custom yellow for him. A manic patient left his wife and drove a thousand miles, got up in the middle of the night, took off all his clothes and ran around a motel parking lot. A manic patient threatened the life of the President, so the Secret Service considered arresting him. You wouldn’t want all the trouble which mania causes for a person and the family. Mania occurs in people with bipolar disorder, another name for what we used to call manic-depressive illness. The distinguishing feature of bipolar disorder is that a person with this disorder has at least once suffered from mania or at least mild mania (what we call hypomania). Fortunately, I have never heard of severe manic symptoms being triggered by bright light in a person who had not previously suffered from mania. The risk seems to be very low for people who have never had mania. People with bipolar disorder commonly experience periods of depression, when an antidepressant treatment such as light might be needed. Bipolar disorder seems to be a biological and genetic illness, just like diabetes, with the peculiar feature that the illness seems to recur and recover, sometimes with little obvious pattern. When somebody with bipolar disorder is treated with bright light, sudden mania might occur. I know of a patient with bipolar disorder who injured a hospital staff member and needed to be placed in restraints within a few hours after a bright light treatment. Fortunately, this severe kind of reaction to bright light is uncommon except among people with bipolar disorder who have had at least one period of mania in the past, and it seems to be rare if the person is taking a mood stabilizer such as lithium, carbamazapine (Tegretol), or divalproax (Depakote). Most people with bipolar disorder should be taking such a mood stabilizer. The risk of mania may be no greater with light treatment than with other effective antidepressant treatments. Perhaps the risk of mania with light treatment is additional evidence that light treatment is antidepressant. Nevertheless, if I had ever had a mania, I do not think I would risk bright light treatment unless I were taking a mood stabilizer, and unless I were under close doctor’s supervision. It is likely that wake therapy also increases the risk of mania. Mild manic symptoms or irritability have been triggered by bright light in perfectly normal research volunteers and among people who have never had mania. Usually the problem is just poor sleep or feeling a bit angry or feeling a bit hyper. Nevertheless, it is important to recognize these symptoms when bright light produces them, because the dosage of bright light should be immediately reduced or the use of bright light should be discontinued until these symptoms go away. Some people find that they have to balance their dosage of bright light: too little light leaves them depressed, but too much may leave them irritable or hyper. Certainly, anybody who is having these symptoms from bright light should immediately discuss them with a doctor. There is some indication that the risk of mania is greater when bright light is used in the early morning. Possibly, waking up early increases the risk of mania. Researchers at the National Institute of Mental Health have reported preliminary studies which suggest that when bipolar patients experience switches between mania and depression at least four times a year, bright light treatment works best in the mid-afternoon. Much as we love the sun, we all know how sunburn hurts. More serious, sunburn and too much sun cause skin cancers, some of which can be fatal. The risk of sunburn and skin cancers such as melanoma seems to be increasing, because air pollution is reducing the layer of atmospheric ozone which normally shields us from most of the sun’s ultraviolet rays. Damage to the ozone layer is allowing the sun to cause more sunburn than sunshine used to cause. People need to get bright light without increasing their risk of sunburn. Fortunately, you can get plenty of light without sunburn. The benefits of light for depression, the body clock, and sleep, seem to come through the eyes. There is no need for any sun at all to fall on the skin, so from my point of view, long sleeves, long pants, and a hat are just fine for people who want to get their bright light outdoors. Sun screen may help. There is no persuasive evidence that light hitting the skin is antidepressant. I have also explained that bright light in the early morning or just before sundown is often the best for the body clock. From the moment the sun rises above the horizon (at least if it is a clear day), the light may be bright enough to do you some good and keep you from wilting. These morning and evening times are therefore particularly good times to get outdoors in daylight, possibly even more effective than mid-day for most people. Unfortunately, the minute the sun goes below the horizon, the twilight grows too dim to be useful. Oddly enough, the ultraviolet rays which cause sunburn are scattered more by the atmosphere and absorbed more by ozone than are the visible colors of light which make up sunlight. As a consequence, the strong ultraviolet which causes sunburn is mainly a problem when the sun is almost overhead. The greatest risk of sunburn is between 10 AM and 3 PM. There is less risk of sunburn before 10 AM or after 3 PM. For these reasons, I recommend that people try to get most their daylight exposures before 10 AM or after 3 PM, except in the winter, when the sun is low even at noon. The risk of sunburn is less important, of course, for those using long sleeves and a hat or sun screen for protection. Except in winter, if you would like to get your daylight exposure at mid-day, consider sitting in the shade. Since it is light entering the eyes which is important for your mood, not what falls upon your skin, your eyes usually see plenty of sunshine even when you are sitting in the shade. Also, in most sunny weather (except very dark rainforests), even shade is several thousand lux during daylight, and therefore the light is helpful. Most artificial lighting does not contain enough ultraviolet rays to create any risk of bright light treatment, but there are exceptions. Some “full spectrum” bulbs can cause a sun burn if you get very close and if the light does not have a diffuser which filters out the ultraviolet. There is also some ultraviolet produced by the halogen bulbs, but I doubt that much is reflected in the indirect lighting. Purple ultraviolet tanning lights, of course, give off intense ultraviolet light, so you should not look at that light. It is true that you can burn the retinas of your eyes by staring at the sun. You should not stare at anything that bright, whether the sun itself or any very bright point of light. As I have mentioned, fluorescents with diffusers spread the light out enough to eliminate this risk. Using indirect lighting also eliminates this risk by spreading out the very bright point of light. So far as I know, you can’t do your eyes permanent harm with any of the commercial fluorescent lights or with incandescent lighting used indirectly. It is worth a reminder, nevertheless, that you should not stare at anything so bright that it hurts your eyes. The limit of brightness above which the risks outweigh the benefits is probably around 10,000 lux. Anything much brighter than 10,000 lux is probably unwise. People with special eye problems should ask their eye doctors for further advice about their special problems. Some doctors have theorized that people taking certain drugs such as major tranquilizers (example: Thorazine) or lithium could hurt their retinas with bright light treatment. Since millions of people have taken these drugs and have gone out into sunlight, I think that this risk must be quite minimal. There is a kind of light damage to the eyes which might be caused by the ultraviolet rays in ordinary sunlight. It seems that some clouding of the lens and cataracts may be increased by very extensive exposures to the ultraviolet light in outdoor sunshine – the kind of exposure which fishermen experience if they are out on the water every day for a whole lifetime. It seems unlikely that the kind of daylight exposures which I have recommended (only an hour or two a day over the long run) would have any measurable effect on the lenses of the eyes. However, concern about cataract might be another consideration for trying to spend your time outdoors primarily before 10 AM or after 3 PM, since most of the ultraviolet reaches us near mid-day. With light as with other treatments, there can be too much of a good thing. As we have discussed, bright morning light tends to make us fall asleep earlier and awaken earlier. Thus, bright morning light is the treatment for delayed sleep phase. However, too much morning light can cause the opposite: an unpleasant degree of advanced sleep phase and early awakening. Similarly, although bright evening light is the treatment for advanced sleep phase, too much bright evening light can cause trouble falling asleep and trouble waking up in the morning. Some scientists also think that bright light close to bedtime prevents melatonin from increasing in our blood, as it usually does at that time, and that this may cause trouble with falling asleep. A person using artificial bright light may need to experiment with the timing, duration, and brightness of the light if sleep problems of these types develop. 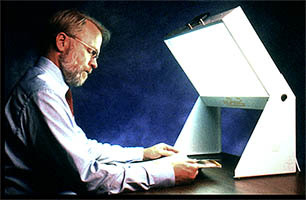 Some people using artificial bright light treatments have reported temporary headaches or eye strain caused by the light. These symptoms do not seem to be serious or to indicate any permanent injury, but they certainly can be unpleasant. If fluorescent light is being used, an electronic high-frequency ballast will probably reduce the risk of eye strain. Most people try to reduce the intensity or duration of the light treatment to reduce these symptoms, unless they find that the benefits of the light are greater than the symptoms caused. In the great majority of cases, bright light treatment (especially in the morning) lifts a person’s mood and increases the person’s energy. Occasionally, however, the effect of antidepressants such as bright light upon a depressed-exhausted person may be to increase energy in a harmful way. There are a couple of cases reported where bright light treatment led to increased suicidal thinking, and at least one suicide has been reported. If the result of bright light treatment is to increase suicidal thinking, it is time to stop the light and time to see a doctor that very same day. Since much of this book has been about using bright light to sleep better, it may surprise you that I think many people try to sleep too much. We are all familiar with the unpleasant feeling of having slept too little, but many of us have not thought about the possible harm of trying to sleep too much. You may have heard somewhere that 8 hours of sleep per night is necessary to be healthful. This just is not so. In our studies in San Diego, the average adult is actually asleep only between 6 and 6.5 hours a night. Moreover, The Cancer Prevention Study II showed that people who report sleep of 6.5 to 7.5 hours live a bit longer than people who sleep 8 hours or more. The shorter sleepers lived longer! Even people who slept as little as 3.5 hours lived longer than those who slept 8 hours or more. Certainly, if you get only 6.5 or 7 hours of sleep a night, you are probably sleeping enough. Incidentally, when we record sleep in people above age 60, the amount of brain wave sleep is often about an hour less than the person reports on a questionnaire. In a study of elderly volunteers for the women’s health initiative, we found that women whose recorded sleep was 5.0 to 6.5 hours lived the longest. Studies show that in the range that most Americans sleep (which is 6, 7, or 8 hours or so), there are few discernable differences between people. This may surprise you, but people who sleep 6 hours seem to be at least as happy as people who sleep 8 hours. Moreover, people who sleep 8 hours get just as much work done and are just as rich as people who sleep 6 hours. There may be some tendency for people with the shortest sleep times (5 or 6 hours) to be outgoing and energetic, whereas people with the longest sleep times (9 or 10 hours) seem to be more introverted, imaginative, or perhaps a bit depressed. Notice the surprise! People who sleep a bit less than average may be less depressed! Indeed, hospital studies of depressed patients show something very surprising. When depressed patients are kept awake all night (or at least for the second half of the night, e.g., after 2 AM), they actually feel less depressed the following day. The sleep loss actually helps depressed mood. This was part of the wake treatment which Dr. Neumeister and Dr. Kasper used, and which is now a part of chronotherapeutics. Moreover, after the wake therapy, taking a nap makes depressive symptoms recur. Wake therapy would be a very popular treatment for depression except for one problem: people with depression who stay up during the night do get sleepy, and after they sleep soundly the next night, the low mood usually relapses (unless bright light is used). Evidently, although it is true that people who are getting depressed have poor sleep, it is not true that getting more sleep helps depression. Often it is quite the opposite. For these reasons, depressed people should not struggle to get more sleep. People may actually improve their moods by getting up a bit earlier. There is another factor. Spending too long in bed – as you might expect – causes people trouble with falling asleep and makes them more likely to awaken while in bed. Sometimes, the frustration of lying in bed awake adds to the problem, and it builds on itself, getting worse and worse. The more time the person spends in bed trying to get more sleep, the more trouble develops in falling asleep and the more the person awakens in the night. Surprisingly, it seems that spending too long in bed might be a major cause of sleep trouble among both elderly and depressed people. Fortunately, there is an easy solution. People who are spending a lot of time in bed lying awake should spend less time in bed. This means either going to bed later or getting up earlier. Getting up by a regular time seems to be important, so trouble falling asleep should not persuade you to sleep late. The less time you spend in bed, the more sleepy you will be the next evening. Think about it. If you spend less time in bed, you will surely tend to fall asleep more easily and sleep more soundly in the future. Moreover, the less time you spend in bed, the more you will restore the habit of falling asleep quickly after going to bed, and the more you improve the habit of sleeping soundly. Some doctors would recommend that you should not spend more time in bed than you actually sleep. If you think you only sleep 5 hours a night, spend only 5 hours in bed until you are sleeping all 5 hours. Then you can try increasing time-in-bed about 15 min., e.g., to 5 hours and 15 minutes. You can gradually increase your time in bed on a weekly basis until you are no longer sleepy enough to sleep at least 85% of your time in bed. Once you are sleeping only 85%, that is the longest bed time which you should allow yourself. Most sleep experts also recommend that whatever bedtime you allow yourself, you should not go to bed if you do not feel sleepy. Moreover, if you awaken at night and no longer feel sleepy, get out of bed, and do not go back until you are sleepy again and expect to fall asleep. Even after being up during the night, you should get out of bed by your regular awakening time, because sleeping late tends to make the problem worse. Getting out of bed when you are not sleepy makes you sleepier the next night and helps maintain good sleep habits. Almost all of us have stayed up entirely for a night or two, so we know that nothing terrible happens to us. Many of the patients I talk to say that they have slept only a few hours a night for years, and yet they are somehow afraid that losing sleep will hurt them. Probably not. Remember that if anything, the short sleepers tend to live longer and be less depressed. If you are willing to stay out of bed and amuse yourself somewhere else when you are not sleepy, soon you will stop worrying about sleep. If you lose a whole night’s sleep or part of a night, so what? It will not be so bad, as long as you do not worry about it. When you do go to bed (because you are finally sleepy), you will have restored your confidence that you are likely to fall asleep, so the long-term problem resolves. It is extremely common that depression, advanced sleep phase, or delayed sleep phase lead to poor sleep habits, and then the poor sleep habits become part of the problem. For this reason, it is important to observe good sleep habits when you are using bright light, in order to restore your sleep confidence. It has been shown specifically that sleep restriction can reduce depression. If bad sleep habits are part of your problem, the website CBTforInsomnia.com can give you more detailed pointers about how to correct sleep habits. This is a commercial web site in which I have no financial interest. DO NOT USE THE POPULAR SLEEPING PILLS: they are too dangerous. For more information about the risks of sleeping pills, see my eBook, The Dark Side of Sleeping Pills . or visit the website. I wrote this little book for the worldwide web, so that people in need could learn how to use light treatment. Much of the book is written in the same tone and language with which I explain light treatment to my patients. I offer opinions and guidance even where the scientific proof is incomplete. People want a doctor’s best advice, even when we are not certain of everything. This is not intended to be a scientific article, but it may be useful to physicians who want to learn more about light treatment and how to use it. For physicians and others who want more scientific facts, I have included a large number of scientific references without attempting to document every opinion. This is my advice, so not every doctor will agree with everything. You can find many of the articles referenced at a medical library or by searching the web through the National Institutes of Health’s PubMed service. You may make printed or electronic copies of this book for yourself or to give to family or friends without charge. I would be happy if this book can help lots of people. The materials are copyrighted ©1997–2018 by Daniel F. Kripke, M.D. and may not be used commercially for sale without permission. Daniel F. Kripke, M.D. is a licensed physician certified by the American Board of Psychiatry and Neurology and an emeritus professor of psychiatry at the University of California, San Diego. Dr. Kripke was elected a fellow of the American Psychiatric Association. Dr. Kripke is also associated with the Scripps Clinic Viterbi Family Sleep Center, La Jolla, California. Dr. Kripke has co-authored hundreds of medical articles and has given invited lectures in 18 countries. In 1973, Dr. Kripke established one of the first sleep clinics in the United States. In 1981, Dr. Kripke published the first controlled clinical trial of bright light treatment. For the past 30 years, Dr. Kripke has been doing research on light treatment and treating patients with light. Dr. Kripke has now retired from practice and no longer consults with patients. Please do not contact Dr. Kripke for personal medical advice. A physician should not give personal advice to a patient he does not know, and the California Medical Board considers it unethical to provide mail or email advice to people who have not been examined. Treatment of depression is best obtained from a nearby psychiatrist. Patients with delayed sleep phase disorder or advanced sleep phase disorder might find help at a sleep center such as the Scripps Clinic Viterbi Family Sleep Center in La Jolla, California. If you have a sleep problem, you might also be interested in reading Dr. Kripke’s other ebook, The Dark Side of Sleeping Pills (in Amazon Kindle format), also available at the website. Some of this material is repeated in both books. Acknowledgment: I have been fortunate that my research has been supported for over 35 years mainly by the U.S. National Institutes of Health (NIH) and the Department of Veterans Affairs. In the past, agencies of the U.S. Army and Navy supported work of Dr. Kripke’s laboratory, and for two years he did medical research in the U.S. Air Force. The Department of Psychiatry, the Sam and Rose Stein Institute for Research on Aging, and the Center for Chronobiology of the University of California, San Diego have also supported my research, as has the Weingart Foundation and the American Cancer Society. Recently, the Scripps Clinic Viterbi Family Sleep Center has been supporting some of my research, particularly the most recent study of mortality associated with hypnotics, assisted by the help of generous gifts from private donors. Ambulatory Monitoring, Inc. (the manufacturer of the Actillume and other actigraphs) and Minimitter-Respironics (makers of actigraphs, now part of Phillips), The Sunbox Company, Apollo Health (now part of Phillips), and Enviro-Med (which make bright light boxes) have supported our research, partly through joint research projects funded by the National Institutes of Health. It is important that readers understand for whom an author has worked. Dr. Kripke has no financial interest in any of the companies or products mentioned or in any commercial web site, apart from a small percentage of the tiny price of his eBook. Being supported largely by public funds, I am able to speak out for public interests. I appreciate this opportunity.